(Nanowerk News) Great excitement at Kiel University: As the DFG (German Research Foundation) announced it will continue to support the research on molecules which function like machines with another 8.9 million EUR. This funding will allow the scientists in Germany's northernmost state to develop new engineering techniques for building tiny machine-like molecules over the next four years. The ultimate miniaturisation of engineering functions should improve the efficiency of energy conversion systems, medicines, diagnostic methods and materials. Moreover, completely new areas of applications will open up along this line. A rigorous evaluation by scientific experts preceded the approval of the project. "My congratulations go to the colleagues from SFB 677- they did an excellent job and the DFG recognised their outstanding work", commented Professor Lutz Kipp, President of Kiel University. "For Schleswig-Holstein, and particularly for Kiel University, these federal funds will strengthen the research, improve international visibility and create numerous jobs for highly qualified scientists." The outstanding level of scientific research and the international reputation of the SFB members significantly promoted the formation of the Kiel research focus 'Nano Science and Surface Research'. 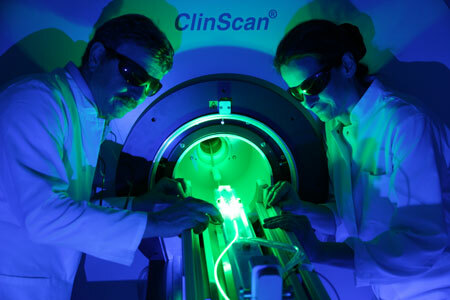 Rainer Herges and Susann Boretius from the Collaborative Research Center 677 test a contrast agent that can be activated by light on an MRI. From the development of tiny machines for technical and medical applications, the researchers expect a tremendous increase in performance, similar to the revolutionary development in microelectronics and information technology during the last decades. However, the basis for a successful development have to be established first. The Kiel SFB provided fundamental contributions to molecular nanoscience along this line. Towards the end of the first funding phase in 2011, the researchers already achieved ground-breaking success. A team under Professor Rainer Herges, spokesperson of the SFB, managed for the first time to control the magnetic state of a single molecule at room temperature - using light at different wavelengths. The tiny magnetic switch is 400 times smaller than the magnetic storage units in state-of-the-art hard disks. Beyond storage applications it will be further developed for the use in minimally invasive stroke and heart operations as well as in MRI diagnostics. "Application oriented research requires a close collaboration of scientists from different areas, says the chemist Rainer Herges. The number of applications for molecular switches is currently growing at an explosive rate and is revolutionising entire scientific fields, such as brain research. But the Kiel labs are still leading in the design and fabrication of functional molecules. Their nanomachines are foremost in efficiency, temperature-resistance and stability. Moreover, Herges' colleagues have been creative and -based on their fundamental research- developed new materials for solar technology, activatable drugs, and improved medical diagnostics. Further applications are being pursued such as the development of construction materials that display fatigue by colour change before they break or fail. Within the last four years the researchers published more than 160 scientific articles in reputed journals and 28 doctoral theses were completed. Two companies have been successfully spun off from the Collaborative Research Centre - one develops light technology for scientific experiments and industrial applications; the other produces materials with specifically designed functions. In the final funding phase, which is now beginning, the researchers want to concentrate further on new applications: "We will be collaborating with material and medical scientists", says Professor Rainer Herges. One goal is to develop drugs that only switch on at the site of the disease and therefore avoid side effects in healthy tissues, as well as molecular machines which convert light energy directly into chemical (storable) energy.